I usually let others do the fine and noble work of recording crappy bicycle infrastructure for posterity but here's an exception. A friend of mine, Claus, was in Berlin not long ago and he just couldn't help taking these photos of the bike lane he was riding on. 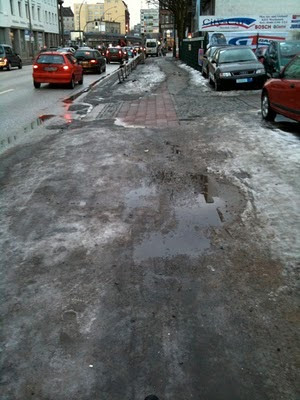 Berlin uses gravel when it's snowy and icy, apparently. The snow and ice were gone but the gravel remained. It was, by all accounts, a nightmare to cycle on. What gets me is that the road, to the left, is completely clear of gravel. Nary a pebble to be seen. What on earth stopped the street sweeper from swerving a bit to the right? Now this design of bike lane, running behind parked cars, is NOT recommended - it's actually quite bizarre to see this kind - but with the bike lane's proximity to the street you'd think the gravel would be removed. This is Berlin. They boast 10%+ modal share [although only in the summer, even though they have the same climate as Copenhagen]. This city should know better. To Claus' amusement, he found a shell in the rubble that was the bike lane surface. Which reminded me of this photo, sent by reader Viry in Hamburg a while back. The bike lanes had disappeared and were forgotten until the spring thaw. Fair enough, this winter was harsh and funding was stretched for snow removal, but again... this Hamburg... they should know better, stuck in the middle between Holland and Denmark.